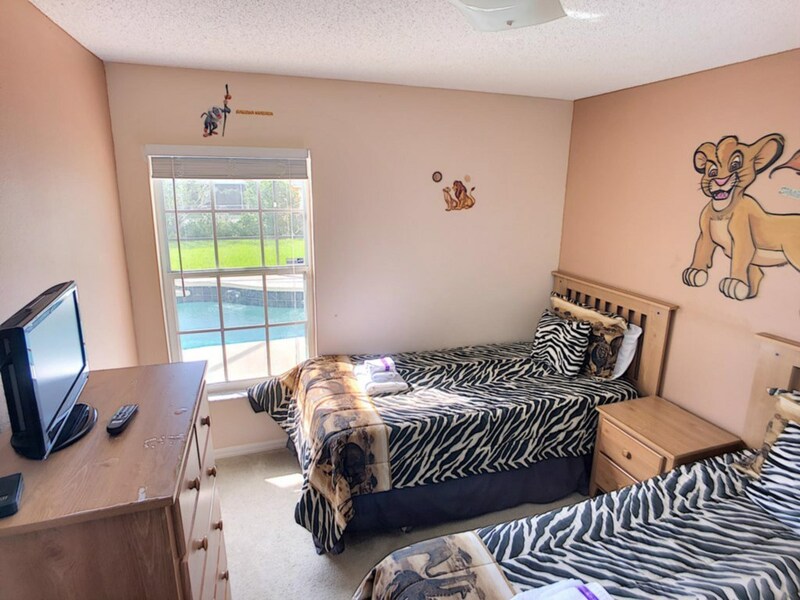 Themed luxury 4 bed pool home in Kissimmee near Disney! Step into Simba's Lake House for your next family vacation, and enjoy the luxurious lake front accommodations! This stylish Kissimmee vacation home is located just 3 short miles to Disney World, but you may find yourself having trouble leaving the comfortable beds, the soft leather reclining sofas, and the relaxing waters of the private screened pool. The spacious kitchen is stocked with all your cooking & dining needs so that you can prepare a perfect family meal to serve at the dining room table. Or maybe it's just snack time and the kiddos are sitting at the breakfast bar munching on a sandwich. The open floor plan makes it easy to keep an eye on the large, HD LCD TV in the living room. As you relax into the soft leather couches, you'll feel all your worries and troubles slip away as you lean back and put your feet up with the reclining seats. Every seat in the living room is a good one, so pop on your favorite show or slide in your favorite movie, pop some popcorn, and enjoy some much needed R&R! If you're traveling with 2 families, each couple can enjoy the privacy of their own comfortable suite with private bathroom! The master bedroom suite features a stylish 4 poster bed, with a TV and a private door out to the pool deck. No worries about tripping over your luggage, as the master suite has a large walk in closet for you to store your suitcases for easy access. After a fun day at the park and swimming in the private pool, you'll melt into the comfortable king size bed. Or maybe it's time for a bubble bath? Sneak into the large master suite bathroom and enjoy the garden tub! The separate glass enclosed shower is a real treat, and you'll enjoy the double sinks so you're not fighting over counter space! Within the front queen suite, you'll enjoy a little extra privacy and separation from the rest of the house. The plush mattress will make you not want to leave!! This suite also includes a TV and a private bathroom, with a shower enclosure and spacious closet. 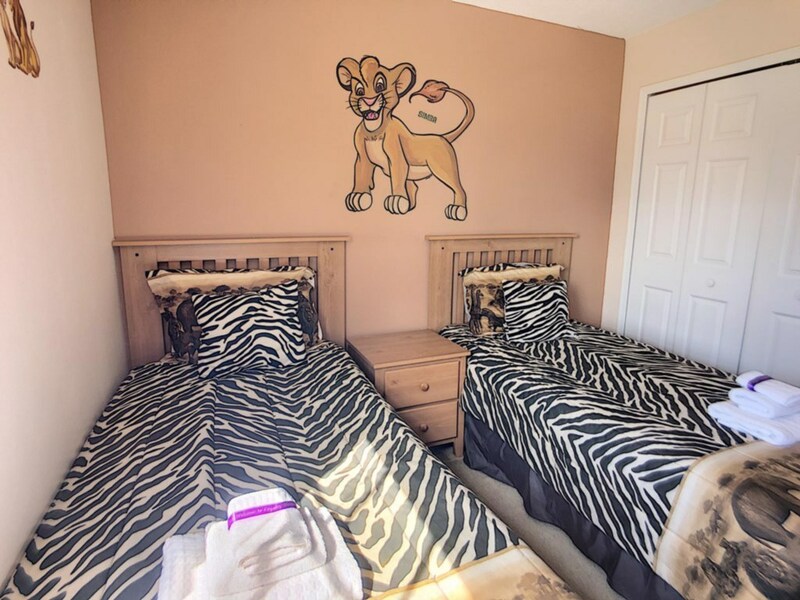 When it's time for the little ones to settle into bed, the kiddos can enjoy Simba's Bedroom or Mufasa's Bedroom. 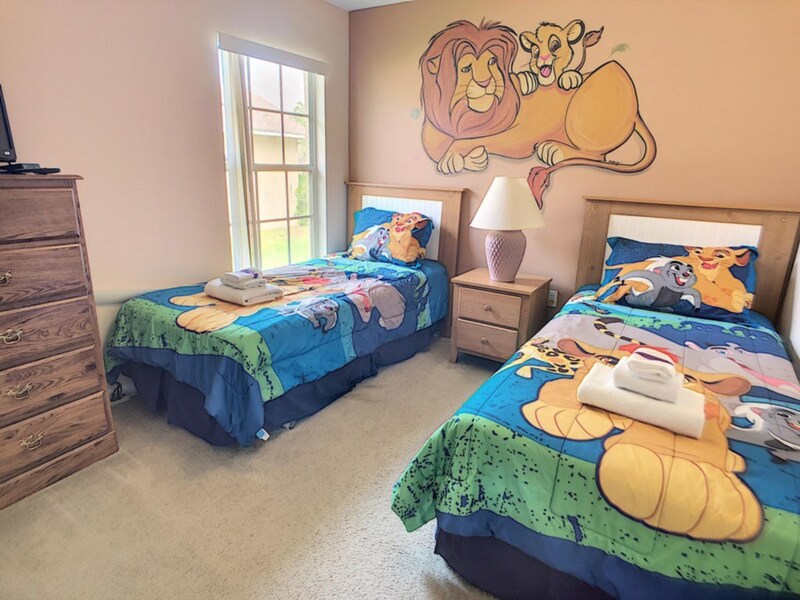 Each features a TV and two comfortable twin beds with custom painted images of everyone's favorite Lion King on the walls. After watching a movie or swimming in the pool, challenge someone to a playful game of darts or pool as you walk into the games room. The games room has large plush couches, so your whole family can play along or watch the game. Or you can surf the internet from your phone or laptop with the free WiFi throughout the house. 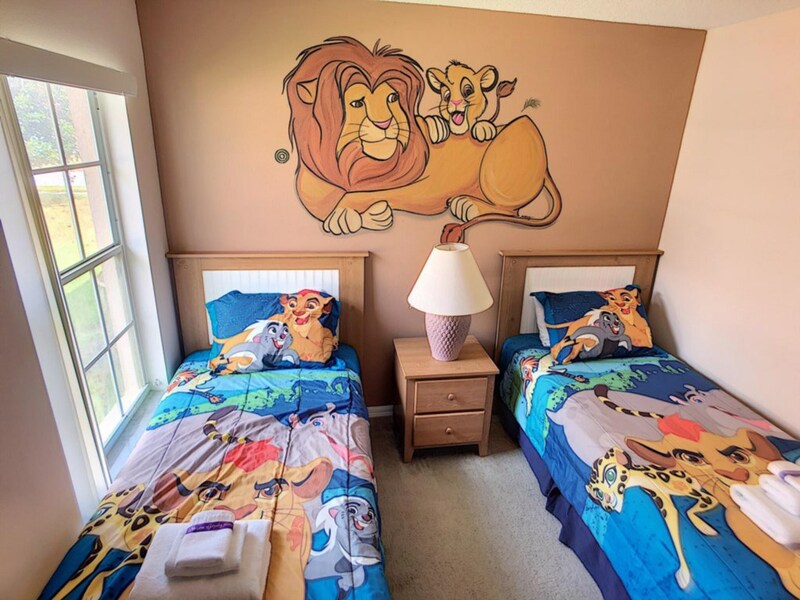 Rest in comfort and style when you book your vacation in Simba's Lake House. You won't regret booking this fantastic Disney vacation home for your family's next getaway, so book now! I just returned home from a 4 day stay at Simbas lake house! Everything went smooth at time of arrival and they even left the outside lights on since I told them I would be arriving later in the evening. The owners were kind enough to allow me to bring my small dog and even left a bowl filled with treats as a welcome gift for him...how thoughtful!?! The inside of the house was as pictured and the couches very comfortable. The location is very close to Disney with convient highway access! It is also about 1/2 mile from a Walmart in case you forget or need anything. I would absolutely book here again!! This home was spacious, clean, and well-themed. It was the perfect size for our family of eight. The kids loved the pool! I loved being so close to Animal Kingdom! We love this area - it's close enough to all the fun, but it doesn't feel touristy. She's wonderful with communication. And my over all stay was great! Thank you! I love staying at Loyalty homes. They are very clean and in a great location. I have stayed at 2 other properties multiple times. I loved them and thought to try another one.. I loved this house. I loved the 2 master bedrooms so my sister and I did not have to fight over who gets it. I will definitely book this house again. Management team is wonderful. I tell everyone I know to book through Loyalty. We enjoy being able to stay in a nice big house while we are on vacation. Being able to get to the house late and get right in without having complications is great. It is private, and as others have stated so close to every park, restaurant, and store. 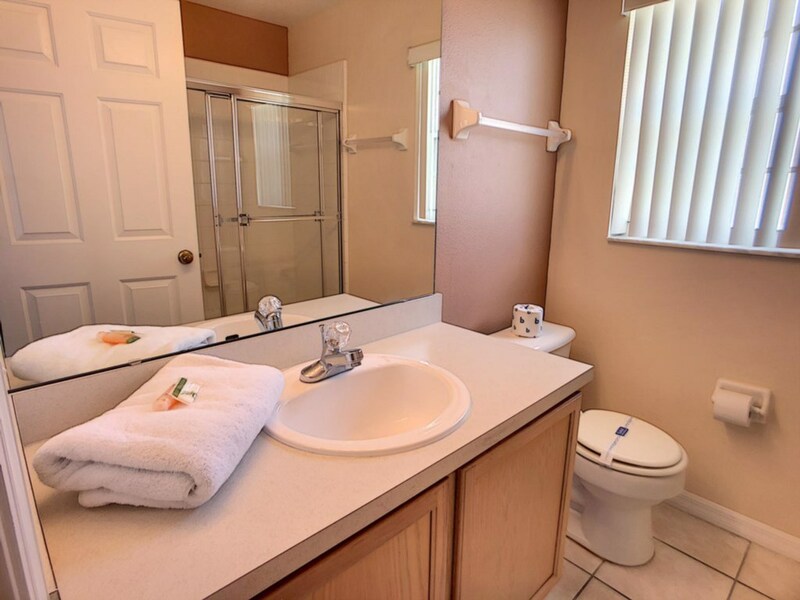 It is especially nice to have all the amenities included that you have at home. This was our second time to stay in one of the loyalty homes and we will absolutely go again. The home was in excellent condition. The distance to the parks was convenient and the description of the house is exactly as we found it. Staying in a house is the best when you have young kids! Our two-year-old loved being able to run around. We moved beds & put a twin mattress on the floor for him, and we brought doorknob covers so we could keep him in the main area of the house. We all enjoyed the view. It was also nice having three bathrooms. This was the most wonderfull vacation I have ever had!